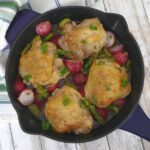 These skillet chicken thighs are served with radishes and asparagus! 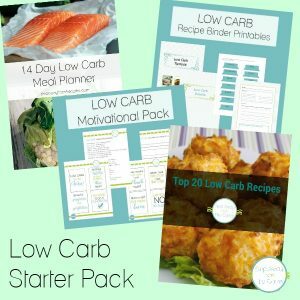 A delicious low carb one-pan meal! This recipe only requires a handful of ingredients and yet it has so much flavor! 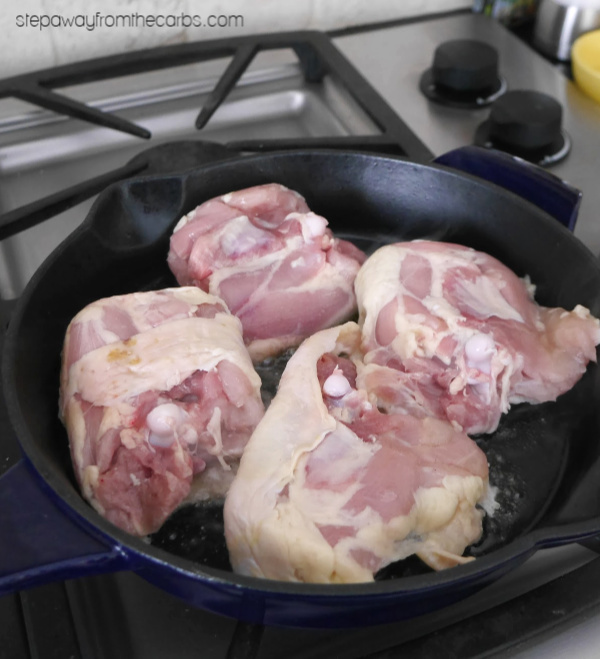 I’ve used bone-in, skin-on chicken thighs because as well as being cheap, they taste so good! 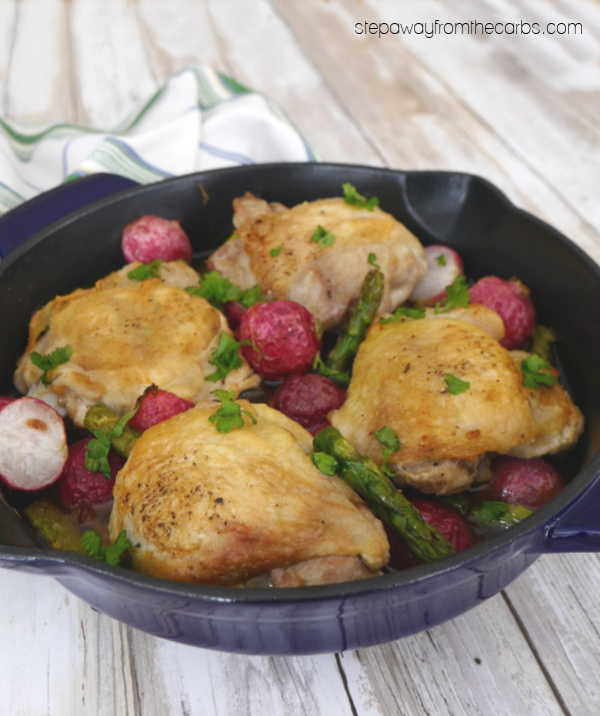 I’ve added radishes and asparagus to the chicken, which makes it even more delicious and so colorful! You don’t need to serve anything else with this either – it’s a complete meal! 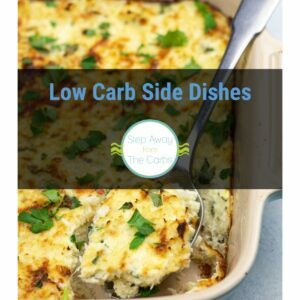 Very convenient for a weeknight meal – and it’s particularly good in the spring when the veggies are in season. 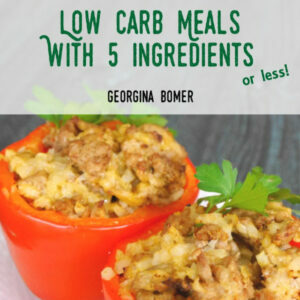 You could even add in a few peas at the last minute of your diet allows! Add some olive oil to a cast iron skillet – I love this one from Anolon. Place over a medium heat. Season the skin of the chicken thighs with salt and pepper, then place skin-side down in the oil. Cook for ten minutes. Transfer the chicken to a plate, and add some halved radishes. Stir them into the oil, and sauté for five minutes. Add in the asparagus, and stir them into the oil. They look so good! 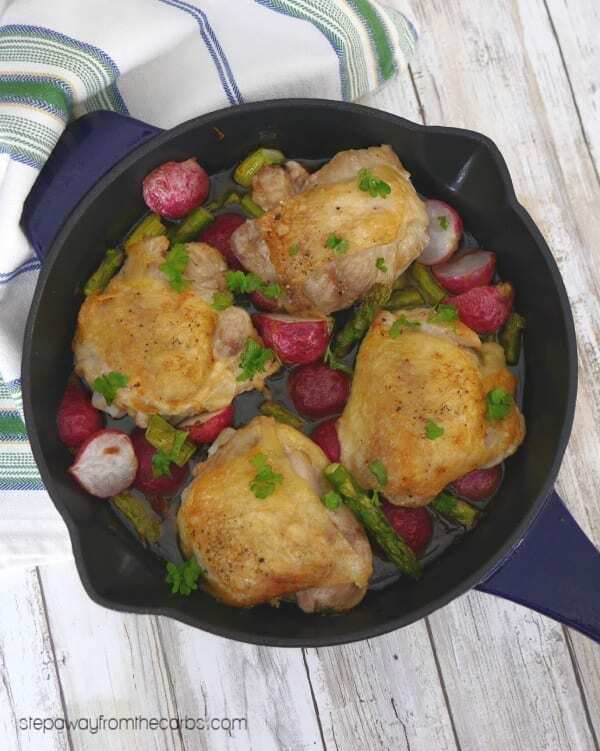 Return the chicken thighs to the pan and roast in a preheated oven for 15 minutes – or until the thighs have reached an internal temperature of at least 165F. Note: Some people prefer the texture of brown chicken meat when cooked to 175F or even 180F. My best advice is to use a probe thermometer and set it to your own preference. Garnish the skillet chicken thighs with chopped fresh parsley, and serve. 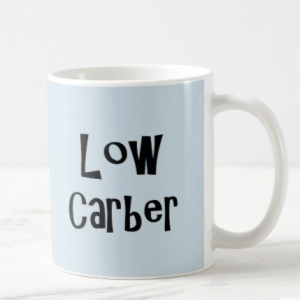 The radishes really mellow in flavor after cooking (you can roast them on their own for a wonderful low carb side dish! ), and they really add a subtle pepperiness to the dish. 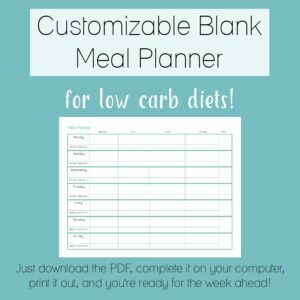 They’re not an exact substitute for potatoes, but they come a close second! Add the oil to a cast iron skillet. Season the chicken with salt and pepper, then place them in the skillet skin-side down. Cook for 10 minutes. 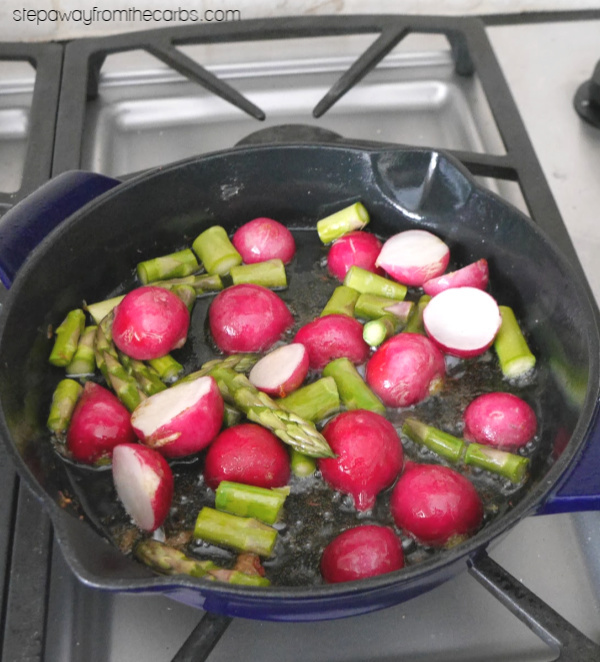 Remove the chicken from the pan, and add the radishes. Sauté for 5 minutes, then add the asparagus. Toss the vegetables in the oil, then return the chicken thighs to the skillet. Roast for 15 minutes or until the thighs have reached an internal temperature of at least 165F. Serve, garnished with the parsley.